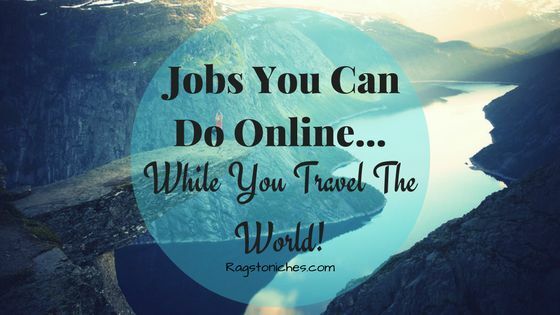 Jobs You Can Do Online: While Travelling The World! Thanks to the internet, the notion of saving for your entire working life, before you get to travel the world- is no longer a fate you have to endure. You can be young, working and travelling from one country to another, all at the same time. This new type of existence – often termed the “laptop lifestyle,” been driven by the rise of of potential to be able to earn money online. Flexible location, (anywhere with a laptop and the internet is going to work!). The ability to really reach for the stars in terms of income potential. Being able to do a job that you love & are passionate about! So, what are the jobs that you can do online, while you travel the world? Freelancing is often thought to be, one of the easiest ways to start making money online. Many freelancing jobs are service based and might require a special skill – but many do not! web design/design skills in general. And of course – all forms of written work too. Really, anything you can think of that someone online may need a bit of support doing in their business, or even in their life. Tim Ferris, (the author of the “4 hour work week,”) even went as far as outsourcing his dating life, hiring people to set up dates for him. Now there are so many “solopreneurs,” online – it can be difficult to fit in everything and with plenty of people making good money, it makes sense to outsource some of the work. The great thing about being a freelancer is that you can work from anywhere – just as long as it has an internet connection. You also get to choose the clients to work with and can have flexible working hours. There are many different freelancing sites where you can seek out jobs and you can also add a profile of yourself and have people find you, (see the top 15 sites to find Freelance jobs). Besides working from freelancing websites, you can also use social media to promote your freelancing business and creating a website for yourself, showcasing your talents, is also a good idea and looks professional. Also, make sure you have dedicated social media accounts for your business and spend some time making connections. Offer useful content and promote your social media channels and website, in order to build up a following. By getting your first freelance job from somebody who you already have some connection with, can be a smooth gateway to entry! It can take some time to land your first client with Freelancing and it can be a frustrating time for many in the beginning, but it is completely within your grasp! Super blog to follow for freelancers: The Horkey Handbook! Blogging is one of the popular ways to make money online today – but with millions of blogs out there, it’s a crowded space. However, only a small fraction of bloggers even know how to monetize their blogs. So, if you’re in the smaller percentage of people who want learn – you’ll have a better chance. While blogging is not an easy or quick way to make money online, it is a rewarding one. Partly because, you have the chance to write about things you’re really interested in, or are passionate about. Another great thing about blogging is, it doesn’t require a lot of money to get started. All you need to get started, is a memorable domain name and some affordable hosting – then you’re ready to get started. Setting up your blog doesn’t require hiring a developer anymore, as you can use a free content management system, such as WordPress. Before you start your blog, you will need to find a niche that’s in demand and, has the potential to make money. Some of the most profitable niches to blog about include: Personal finance, technology, making money online, personal development and weight loss… to name a few. However, these are also some of the most competitive. Useful post: 50 successful blogs in a variety of niches! It’s important that you first consider the competition you’re facing before starting a blog in any niche. If the competition is too tight, it might be wise to narrow down your niche a little. You can always expand it later, once you have built up a solid foundation and an audience. That being said, competition is also a good thing! If their are a lot of people in a space, it means there is money to be made. Getting traffic to your blog will be one of your biggest challenges – but once you have it, there are lots of ways you can earn money. Placing ads on your site. Being paid for guest posts on other blogs, when you’re in demand. Writing sponsored posts for companies. Often you will maximise your earning potential, by earning in a variety of ways from your blog. See how super successful blogger Michelle blogs full time while travelling with her husband, (and two dogs) in an RV! Affiliate marketers can make big bucks online – but while it’s a simple enough concept to understand, it can take a while to see any rewards! The work of an affiliate marketer is to promote and sell a product or service, in exchange for a commission. As an affiliate marketer, your job is to find leads and sell them the product or service you’re promoting. The product owner then gives you a commission for the sale. As I previously mentioned, bloggers can do well affiliate marketing and it can often be their highest paying income stream. A whole host of different websites online! Where commissions are 100%, this is normally because the creator of the product is not selling the product to profit from the initial sale, but by later ones. For example, by selling higher value products on the back end. Or getting people on to their email list, so that they can sell again to them in future. Even though carefully considering how much you can make per sale is important, there are people making a lot of money from lower commissions too. For example, the Amazon affiliate program pays between 4-10%, depending on product and how many products you sell. But how can you find potential buyers? To be an effective affiliate marketer, you should have a website or blog and you’ll want to learn basic SEO, how to create good content and various ways to bring in traffic. Useful post – Where I got started with Affiliate Marketing – full review. If you want to make enough money to sustain travelling around long term, it’s a good idea to look into finding some high ticket offers, that offer a high commission per sale. you’re going to need to be knowledgeable and interested enough in the topic, to work on it long term. The alternative route, would be to consider outsourcing the content creation. Also, some of the best affiliate programs are ones that offer a residual commission, for the lifetime of the customer. These aren’t so easy to come by, but are good to look out for. A great way to make passive income, if successful – is by the creation and sales of ebooks. Digital content is highly sought after and self published ebooks have increased massively in recent years. This has been made possible by Amazon’s Kindle Direct Publishing Program. The great thing about creating an eBook is that you don’t necessarily have to be an expert, although it helps to be one. In addition, you could also outsource the writing job. This allows you to focus on finding the most sought after topics and marketing your eBook. Once the eBook is complete, you can maximize your income by leveraging affiliate marketers too. You can also outsource some of the promotion – upwork.com is a great place to find quality freelancers. Just make sure you check out all their previous testimonials and reviews, before you employ them. Useful Post: The Kindle Publishing program that I took & recommend. YouTube has for a long time been overlooked as a money making channel – but it’s also understandable why. It can take you a very long time and considerable effort to start making money on YouTube. Many “YouTubers,” suggest making a video every day at first and many who find success, will make several videos per week. The biggest YouTube stars are making millions each year by uploading short videos for their followers. However, if you already have other income streams on the go, (for example freelancing or blogging), YouTube would make a great extra side project. If you’re living an exciting life travelling, your journey could be the makings of a popular YouTube channel. So, if you’re not camera shy, it’s something to consider. Like with all other aforementioned money making methods, you’ll need to find a money making niche to build your YouTube channel around. Once you’ve picked your niche, you’ll then need to start creating short quality videos and upload them to your channel. Make sure to use highly targeted keywords in your video titles if you want the to be easily found by your target audience. So how do you actually make money with YouTube? Selling your own service/product and brand endorsements. But often people start off, by just switching on Ads on your channel – which can make you money via google adsense. The key to making a good income through YouTube is building a super large following for your channel. This can take anything from weeks (if the channel goes viral) or years. YouTube should therefore be one of your long term online money making goals and commitments. So, if you’re wanting to make money while travelling – consider a YouTube as a longer-term secondary income source. Travelling the world is on a tonne of peoples bucket-lists, without a doubt – but few people ever get to fulfil that dream! Working online offers you the freedom to work from anywhere and make money doing what you love. If you’ve wanted to make a career move that will enable you travel the world? Working online is that opportunity. But you’ll have to be 100% committed to the task, in order to make it work. If you’re keen to get started online, but feel overwhelmed by information… this is where I got started myself and I highly recommend you check it out. How long have you been wanting to work online and travel? For me it’s hard to draw a line between being an affiliate marketer and running a blog. Is there anything that truly an affiliate marketer’s website than a blog? I mean I do have a specific niche to blog on, and occasionally I do write reviews on some products. Does that make me a blogger or an affiliate marketers? Either way, I know it takes a load of hard work before seeing any success.